Science, Technology, Engineering, and Math (STEM) education is essential to our environment, health, security, and economic competitiveness, and it is our obligation to empower future generations with the tools and knowledge they will need to solve the global problems they will inherit. Yet, according to the Council of Advisors on Science and Technology, the U.S. is not producing enough STEM undergraduate degrees to match the forecasted demand for STEM professionals. Lack of content competency and low interest in STEM are drivers of this workforce gap. 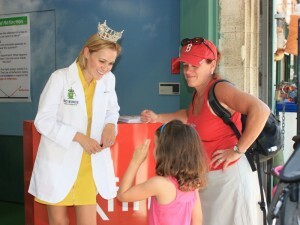 To address the STEM workforce gap, Dr. Erika Ebbel Angle, a graduate of the Massachusetts Institute of Technology with a doctorate in biochemistry from Boston University School of Medicine, founded Science from Scientists (SfS) in 2002 with the specific mission to teach and inspire the next generation to identify and solve real-world problems by improving STEM literacy. Her own life was strongly shaped by experiential science – she won the California state science fair three times on her way to choosing a career as a scientist and entrepreneur. Erika wanted to give all students the chance to experience the excitement of doing real experiments, making real discoveries and appreciating how amazing our world is. This year, SfS will deliver our during-school STEM programming to 9,000 elementary and middle school students across Massachusetts, California and Minnesota. Our SpectacuLAB show in the Epcot® Innoventions Pavilion, located at Walt Disney World® Resort in Florida, reached more than 8,500 children and families per month. Since our founding in 2002, we have served more than 157,000 students and families. Social Pressure: Excelling at Science is often seen as ‘uncool’ by elementary and middle school students. This is especially common amongst young girls, in which this stigma persists and impacts the diversity in the STEM workforce pipeline. Time Constraints: There is an emphasis on allocating time towards English Language Arts (ELA) and Math due to testing, and a lack of time to prepare and create a hands-on Science lesson. Staffing shortages: There is a shortage of elementary and middle school science teachers. Unfortunately, it is common that a physical education (PE) teacher is reallocated to teach Science. Out of date content: Science content is always being updated and classroom teachers feel anxious teaching content that has since been updated outside of the textbooks. Lack of Hands-on Labs: Students rarely have the opportunity to engage in hands-on learning until they reach high school. By bringing hands-on STEM learning to elementary and middle school students, we are able to excite and engage students earlier in the pipeline and prepare them for more challenging high school courses. Lack of Parental Involvement: Parents struggle to find opportunities to extend students’ learning at home. Research shows that parental involvement and support, particularly in earlier years, boosts academic achievement. No Aspirational Role Models: Students in elementary and middle school rarely have the opportunity to interact with STEM professionals and role models outside of their doctor or dentist. This limits their understanding of exciting career opportunities in STEM. 2002: Science from Scientists was founded by Dr. Erika Ebbel Angle in Boston, Massachusetts. 2005: Presented our core during-school STEM program at our first partner school in Massachusetts. 2014: Expanded operations to the Bay Area, California. 2015: Expanded operations to Central Massachusetts. 2016: Expanded operations to Bloomington, Minnesota. 2017: Providing STEM programming to 10,000 students per year across Massachusetts, California, and Minnesota. Launched the SpectacuLAB presented by Murata featuring Science from Scientists, located at the Innoventions® pavilion in Epcot at Walt Disney World® Resort. Learn more about the work we do through our Guidestar profile.